Whether you’re celebrating Earth Day, spring or need a festive sip at the end of a Monday, this delicious cocktail by our guest editor Heather Taylor is perfect for you! Take it away Heather! I have had jam-packed work weeks getting ready for our gallery reopening at the end of the month, so I granted myself a relaxing sunday with no plans other than reading the paper and puttering around the kitchen. 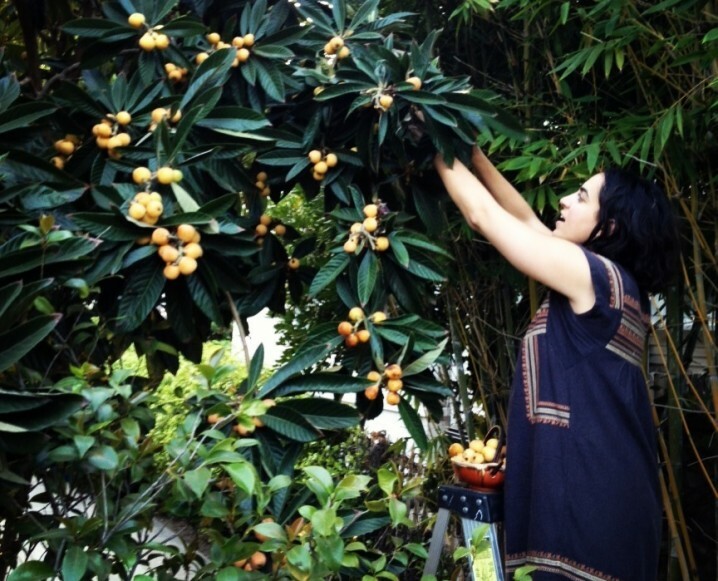 It turned into the day of the loquat, as my tree is overflowing with ripe fruit ready to be eaten. With fantasies of refreshing afternoon cocktails in mind, I decided to make loquat syrup. I put together the easy syrup in under an hour. 4. Melt the sugar in the loquat juice over med-low heat and then raise heat to med-high to bring it to a boil. Reduce heat and simmer for 5 minutes. Will keep in the fridge for about a week or you can freeze cubes of the syrup if you’d like for future drinks and projects. Mix two spoonfuls of syrup mixed with sparkling water and lemon. Served over ice. Mix two spoonfuls of syrup mixed with a shot of vodka, the juice of a lime, a splash of rose water and ice. Topped with sparkling water and served in glass rimmed with rose sugar and finished with a lime wedge. Enjoy! Share the post "Loquats in Bloom"
I tried the loquat rose cocktail today, very, very yummy. This recipe will see a return in the not too distant future. Thrilled you liked it, Linda!